Citation: C N Trueman "James I and his favourites"
James had married Anne of Denmark in 1589. While James liked to think of himself as an academic who possessed a great depth of thought, Anne proved to be frivolous and shallow. James preferred to keep the company of men who flattered him with regards to his wit and intelligence. It was these favourites that he brought to London with him – and it was these favourites that were to do a great deal to undermine his standing in Parliament. Many MP’s were greatly angered that they were being bypassed in the decision-making process and that a huge amount of the advice given to James came from non-elected men – who also came from Scotland. Not only did James seek out these favourites for advice, he was also very generous with regards to royal revenue. James believed in royal magnificence and this included treating his favourites. His early favourites were Viscount Haddington, Lord Hay and the Earl of Montgomery. James considered it perfectly acceptable to pay off their debts using his own revenue before paying off his own debts. This is what happened in 1607 when James paid off the debts of all three men at a cost of £44,000 – money he could ill afford to spend. James’s extravagance was bound to cause anger when it is considered that the bulk of his generosity assisted those from Scotland who had traveled to London with the new king. By 1610, nearly £90,000 had been given to Scots in gifts and another £10,000 paid out in pensions. In an average year, Scottish followers based in the royal court received £40,000 in total while their English equivalents received £10,000. It could be argued that those Englishmen needed a royal handout a lot less than their Scottish counterparts because of their extra wealth – but it did cause antagonism in the royal court. What caused the most resentment in London and among the influential rural gentry was when Scottish favourites gained a title. The most notorious was when Robert Carr of Ferniehurst was knighted in 1607 and then made Viscount Rochester in 1611. Carr was a coarse man who brought discredit on the English court. The king’s public displays of affection for Carr and others did not go down well at court. Robert Carr had been a page to James in the Scottish royal court. He had come to London as a member of the Hay household. However, he had very little money and James decided to change this. The favourite of the king had to have a suitable standing in society and that included property. James could not hand out crown land as these had been entailed. 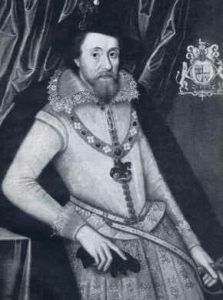 In solving this problem, James was helped by his Chief Minister Robert Cecil. He suggested to the king that Sherbourne Castle in Dorset could be handed over to Carr as it had belonged to the imprisoned Sir Walter Raleigh. The explorer’s attempt to keep Sherbourne Castle for his wife via trustees was found to be legally flawed. James followed Cecil’s advice and the estate was handed over to Carr with the resultant increase in his social standing. Few English nobles were to experience such generosity. Robert Carr married Frances, the daughter of Thomas, Earl of Suffolk. Frances was already married to the Earl of Essex but James took a great interest in the annulment proceedings. The marriage ended because of the impotency of the Earl of Essex and the fact that Frances had been a child bride. James all but presided over the marriage arrangements himself. The wedding was in September 1613 and all accounts of it describe its magnificence. In November 1613, James made Carr the Earl of Somerset. Somerset had been the favourite of James since his accession in 1603. In 1614, James found a new favourite – George Villiers. James first met Villiers at Apethorpe in 1614. James was forty-seven. Villiers was twenty-two when he first met James. He was tall, handsome, muscular and very ambitious. He was from a minor noble family from Leicestershire and had spent time in France learning how to dance, duel and ride. With the decline in the influence of Somerset (after the murder of Sir Thomas Overbury), the rise of Villiers was fast. In 1616, Villiers was appointed Master of the Horse, made a Knight of the Garter and created Viscount Villiers. In 1617, he became Earl of Buckingham and in 1619, James made him a Marquess. The speed of the fall of Robert Carr, Earl of Somerset, was matched by the speedy rise of George Villiers. James referred to Villiers as “my sweetheart”, “my sweet child and wife” and “my only sweet and dear child”. In response to this Buckingham flattered the king at every opportunity. Buckingham’s rise to authority, power and influence angered many. He used his position to promote men who would be loyal to him – such as Lionel Cranfield, and Buckingham was also astute enough to cultivate a close friendship with the future king, Charles. Therefore, the influence of Buckingham in the later years of the reign of James, continued into the reign of Charles and caused much resentment.